Liberation means the act or process of trying to achieve equal rights and status. The Philosophy of Liberation page discusses the various issues related to Human Rights, Dalit Studies, Women Studies and ideas on Social Change. A Lecture on “Social Philosophy of Dr. B.R. 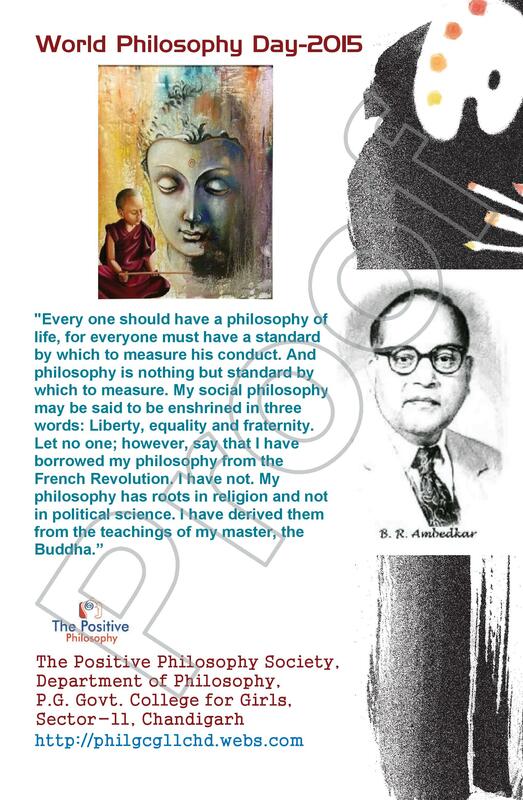 Ambedkar” organised on “World Philosophy Day-2015” at Departments of Philosophy & Hindi, P.G.Govt. College for Girls, Sector-11, Chandigarh held on 19-11-2015. The Role of Religious and Spiritual Values in Shaping Humanity ( A Study of Dr. B.R. Ambedkar’s Religious Philosophy) in 3rd International Dharma-Dhamma Conference on Harmony of Religions: Welfare of Humankind, held on 24-26 October, 2015 at Indore (MP). RUSA Sponsored One-Day Faculty Development Programme on “Dr B.R.Ambedkar, Indian Constitution and Indian Society”organised by Department of Philosophy and Department of Public Administration, P.G.Govt. College for Girls, Sector-11, Chandigarh held on 20th January, 2016. “Empowerment of Marginalized Groups: An Ambedkarite Approach” in Two Days ICSSR Sponsored Two-Day National Seminar on “Human Rights for the Empowerment of Marginalized Communities in India: Understanding and Rethinking Strategy” at Department of Philosophy, P.G.Govt. College for Girls, Sector-42, Chandigarh held on 11th & 12th March, 2016. All the above, initiatives successful was due to your co-operation and blessings. Hope in future too, we will be guided and motivated by your sincerely dedication towards academics and social responsibility. Post Graduate Govt. College for Girls, Sector-11, Chandigarh-160011.